February 17, 2012 from Beijing, China I’m happy to be reporting today from Beijing, where I’ve just finished a second day of investor meetings on my 10-day, multi-city China trip. Things are going quite well; the level of interest among investors wishing to fund films made outside of China is higher than I’ve ever experienced. With a little luck I’ll be making an announcement regarding my company, Pacific Bridge Pictures, in the coming weeks. Of course, any announcement I might make would pale in comparison to the one apparently being engineered by Dreamworks Animation (DWA) CEO Jeffrey Katzenberg. Although it hasn’t happened yet, it’s been widely reported that Katzenberg has arranged to have China’s President-apparent Xi Jinping announce today the formation of a new three-way, Chinese government-backed, $2 billion joint-venture between DWA, Shanghai Media Group, and China Media Capital. According to reports in the Chinese press, under the terms of the joint venture the three companies will construct a studio facility in Shanghai with the intent of developing and producing film, television and live stage productions aimed at the booming Chinese media market. None of the partners has deigned to comment or confirm the reports, but we’ll presumably know today whether there is truth to the story. Assuming it is true, I’m giving Jeffrey Katzenberg a virtual kowtow of admiration and respect for his exemplary showmanship. 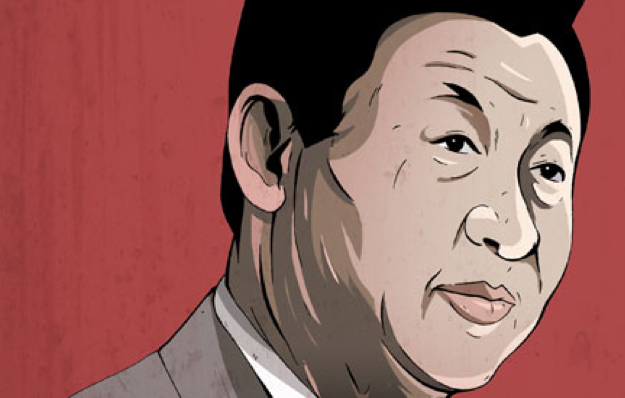 Enlisting China’s President-to-be as his emissary is a brilliant political and public relations coup, and a win-win both for him and for Xi. As he prepares to assume the mantle of leadership in the People’s Republic, Xi gets to demonstrate China’s largesse (and importance) to the U.S. by showering a major Hollywood company with a $2 billion ‘gift,’ while deflecting attention from China’s extremely one-sided behavior with respect to entertainment trade. For Katzenberg, Xi’s endorsement would cement his standing in China’s animation business, and also send an important signal to Hollywood that he sees China as his most important territory after North America. Although they have been quieter until now than DWA, Hollywood’s other major animation companies should not by any means be counted out. 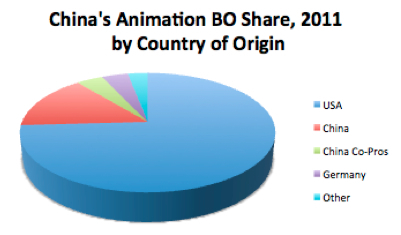 It hasn’t escaped the attention of Universal’s Illumination or Disney’s Pixar that China’s family animation market tripled in size in 2011 versus the prior year. With heavy government support and a voracious market for animated films and TV programs and related merchandise, China will likely become the world’s biggest territory for these companies–even bigger than the US–in less than a decade. 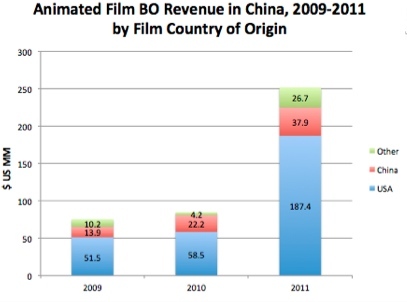 Although fewer than a quarter of animated feature films released in China are made by U.S. companies, these films dominate the market with a nearly 75 percent share of the box office. China has a lot of catching up to do before its animation production companies can compete in terms of storytelling, technical quality, and global commercial viability. Because U.S. expertise is highly prized in China, America’s major animation companies can anticipate that their futures there will be very bright indeed. This entry was posted in Analysis, General News, Opinion and tagged China Media Capital, China's animation business, Dreamworks Animation, DWA, Illumination Entertainment, Jeffrey Katzenberg, Rob Cain, Robert Cain, Shanghai Media Group, Xi Jinping by chinafilmbiz. Bookmark the permalink. Wishing you much success with your upcoming announcement.